First-time doctoral enrollment in history, English, and other arts-and-humanities disciplines fell 0.5 percent from 2013 to 2014. 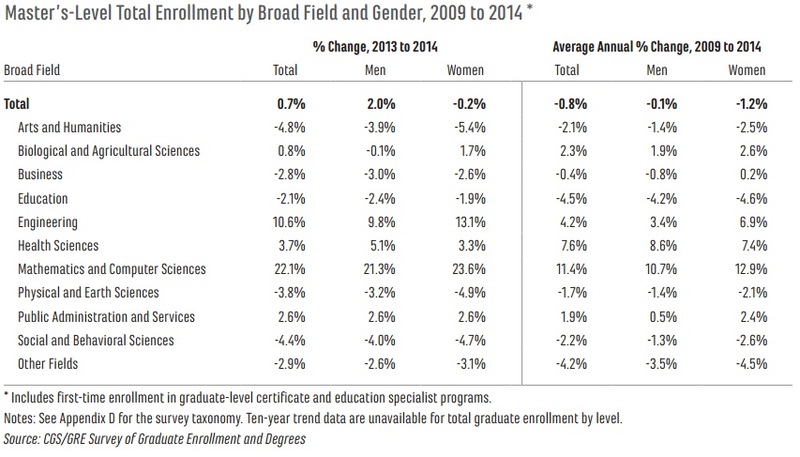 Doctoral enrollment for all fields increased an average annual rate of 1.2 percent during that time period, and grew almost 2.0 percent from 2013 to 2014.
graduate school, graduate student enrollment, and graduate degrees and certificates conferred. Both CGS and GRE believe that graduate education is a vital part of U.S. higher education and that providing an annual examination of trends in graduate applications, enrollment, and degrees by broad field of study, degree level, and demographics, is essential for understanding the graduate education enterprise. 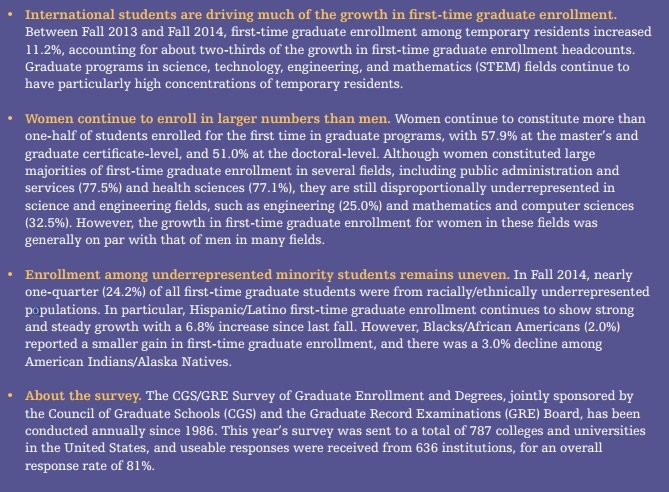 The CGS/GRE Survey of Graduate Enrollment and Degrees is the only national survey that collects data on first-time and total graduate enrollment by all fields of graduate study. It is also the only source of data on graduate enrollment by degree level (master’s versus doctoral) and the only national survey that collects data on applications to graduate school by broad field of study. 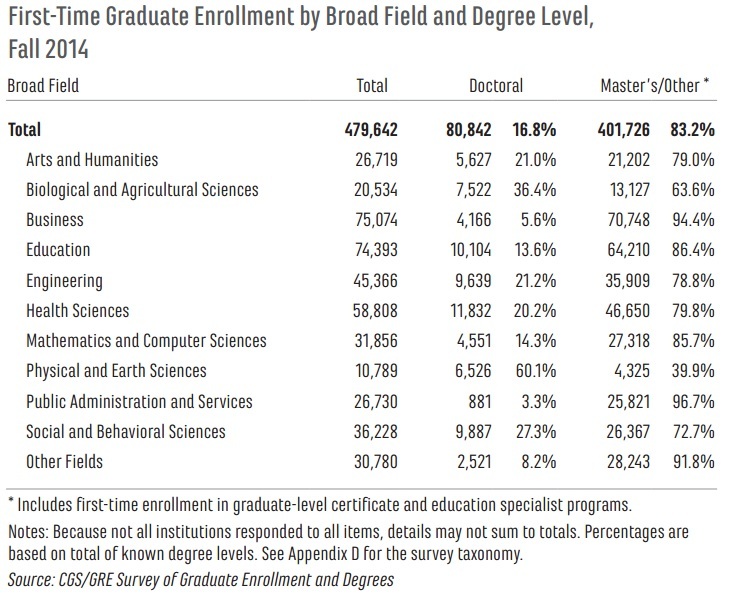 More than 1.7 million graduate students were enrolled in graduate certificate, education specialist, master’s, or doctoral programs at U.S. graduate schools in Fall 2014, according to institutions responding to the 2014 CGS/GRE Survey of Graduate Enrollment and Degrees. Although total graduate enrollment has declined slightly since reaching its peak in 2009, the 2014 survey established several new watermarks for the graduate education enterprise. For the first time since the survey was launched in 1986, the number of applications received by responding institutions eclipsed two million. Moreover, the 479,642 incoming graduate students for Fall 2014 set a new record for firsttime enrollment. This section will highlight the state of graduate education with respect to applications for admission for Fall 2014, first-time and total enrollment in Fall 2014, and graduate degrees and certificates conferred in the 2013-14 academic year. 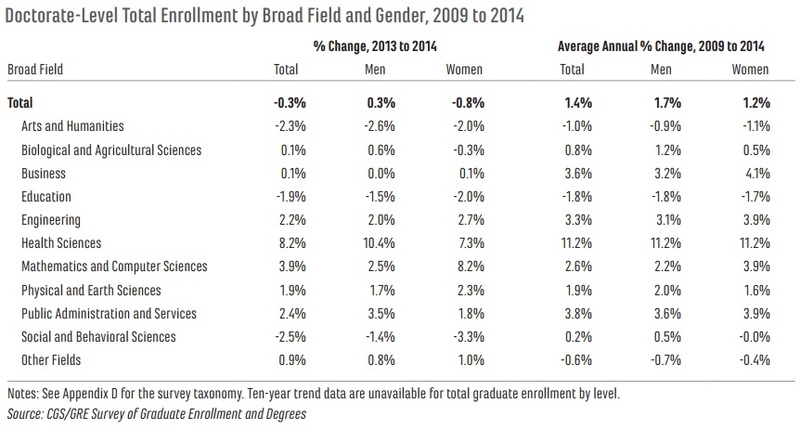 First-time enrollment is a common indicator of trends in graduate enrollment. 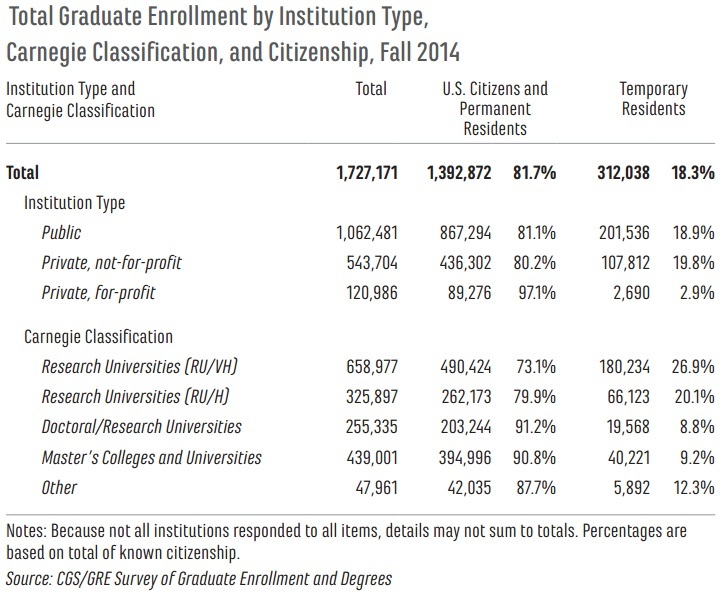 A total of 479,642 graduate students enrolled for the first time in graduate certificate, education specialist, master’s, or doctoral programs in Fall 2014 according to the institutions responding to the CGS/GRE Survey of Graduate Enrollment and Degrees. The majority (83.2%) of all first-time graduate students in Fall 2014 were enrolled in programs leading to a master’s degree or a graduate certificate. First-Time Enrollment—Includes the number of students enrolled for the first time in graduate certificate, education specialist, master’s, or doctoral programs for the fall term. 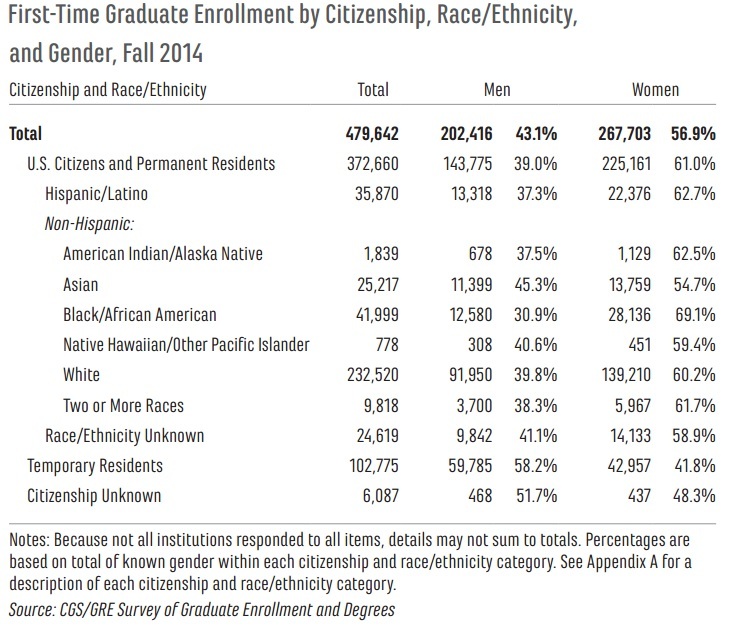 Data are collected by fine field, degree level (master’s/other vs. doctoral), gender, race/ethnicity, citizenship, and enrollment intensity (full-time vs. part-time). 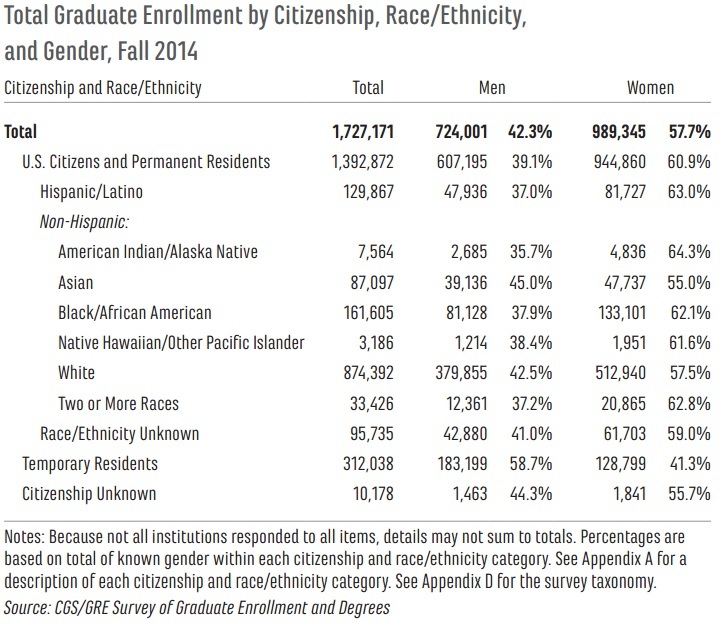 vs. doctoral), gender, race/ethnicity, citizenship, and enrollment intensity (full-time vs. part-time). that award at least 20 doctorates per year. Doctoral/Research Universities—Other universities that award at least 20 doctorates per year. than 20 doctorates per year. year, as well as institutions awarding graduate degrees where a high concentration of degrees is in a single field or set of related fields (e.g., theological seminaries, medical schools, health profession schools, schools of engineering, etc.). original peoples of North and South America (including Central America) who maintains cultural identification through tribal affiliation or community recognition. East, Southeast Asia, or the Indian subcontinent, including, for example, Cambodia, China, India, Japan, Malaysia, Pakistan, the Philippines, South Korea, Taiwan, Thailand, and Vietnam. black racial groups of Africa (except those of Hispanic origin). origins in any of the original peoples of Hawaii, Guam, Samoa, or other Pacific islands. Hispanic/Latino—A U.S. citizen or permanent resident of Cuban, Mexican, Puerto Rican, South or Central American, or other Spanish culture or origin, regardless of race. This includes: Native Americans, whites, blacks, Asians and mixed races.